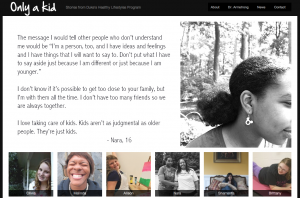 In Fall 2012, through her course “Documentary Engagement,” Ogburn paired Duke undergraduates and graduate students with girls between the ages of 10 and 17 enrolled in Duke’s Healthy Lifestyles program in order to collaboratively tell their stories using photography and audio. These girls had all been referred to Healthy Lifestyles by their pediatricians because they were in “the red zone” (had a body mass index (BMI) in the top 5 percent for their age category). Duke Healthy Lifestyles is an interdisciplinary program which combines medical monitoring and care with exercise, diet and educational programs, in order to support entire families live healthier lives. The goal of this service-learning class was to better understand the many factors which contribute to today’s pediatric obesity crisis while also developing materials which can be used to inform, educate and motivate a wider public.